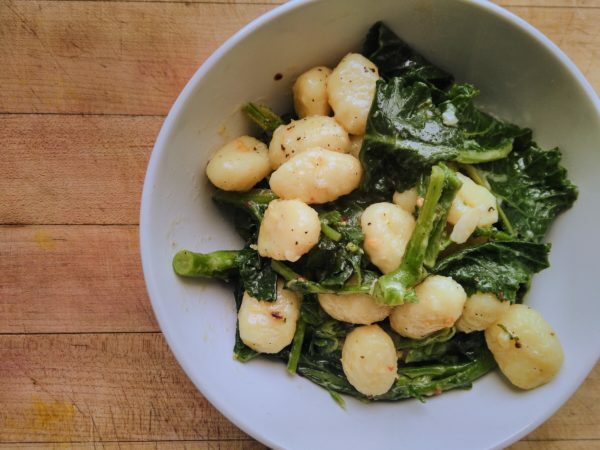 By cooking the broccoli and gnocchi in the same pan, you can have this on the table in under 15 minutes! Split any thick stems on the Purple Sprouting Broccoli lengthways so they cook nice and quickly, and then chop it into bite sized chunks. Boil the broccoli for 1 minute and then add the gnocchi. After 2 or 3 more minutes the broccoli should be tender and the gnocchi cooked and floating. Drain when ready and leave in the colander. Put the same pan back on the heat with plenty of olive oil. When hot, add the garlic, lemon zest and chilli flakes and sizzle for a couple of minutes.